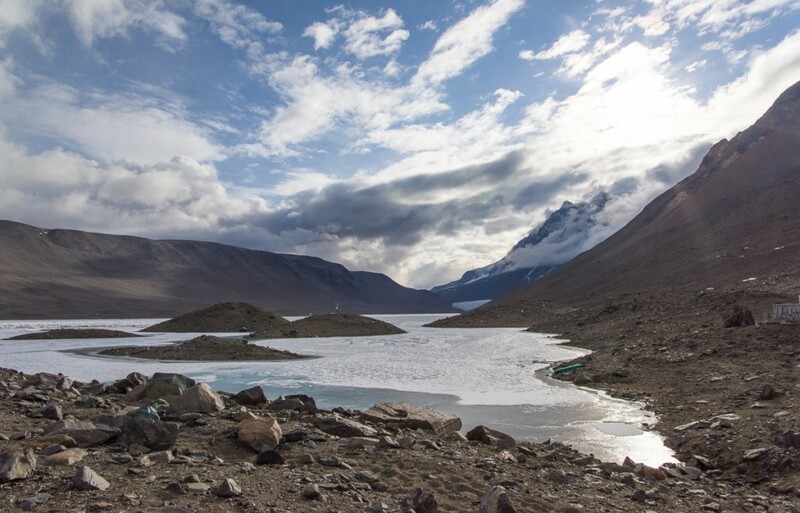 The Lake Hoare field camp in the McMurdo Dry Valleys, where I spent five days, sits at the east end of the lake right next to the immense Canada Glacier. At the opposite end of the lake is the smaller Suess Glacier. 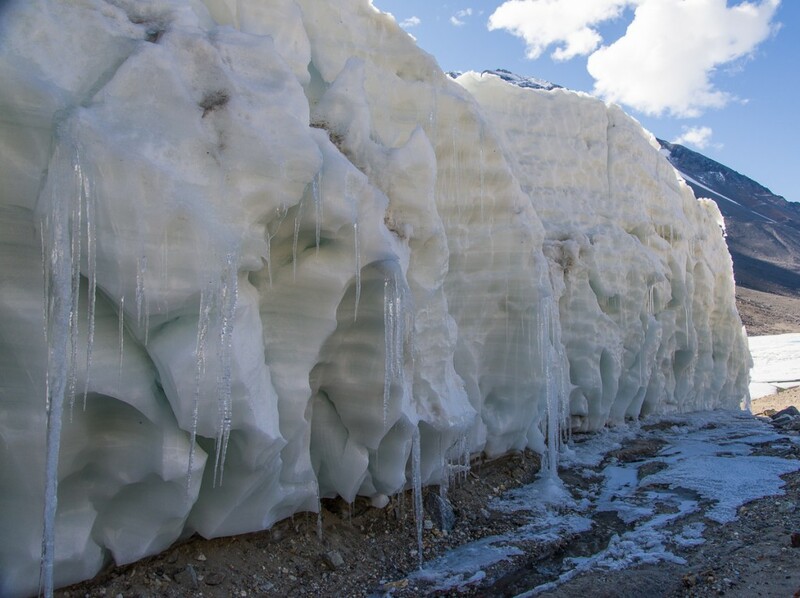 When I first heard the name, it would not have surprised me if a glacier in Antarctica had been named for the children’s book author Dr. Seuss, given the odd landscape features that resemble some of his fanciful illustrations. But no, the 1910-13 British Antarctic expedition led by Robert F. Scott named it for Professor Eduard Suess (1831-1914), a prominent Austrian geologist and paleontologist who helped lay the basis for paleogeography and tectonics. View up Lake Hoare from the field camp. 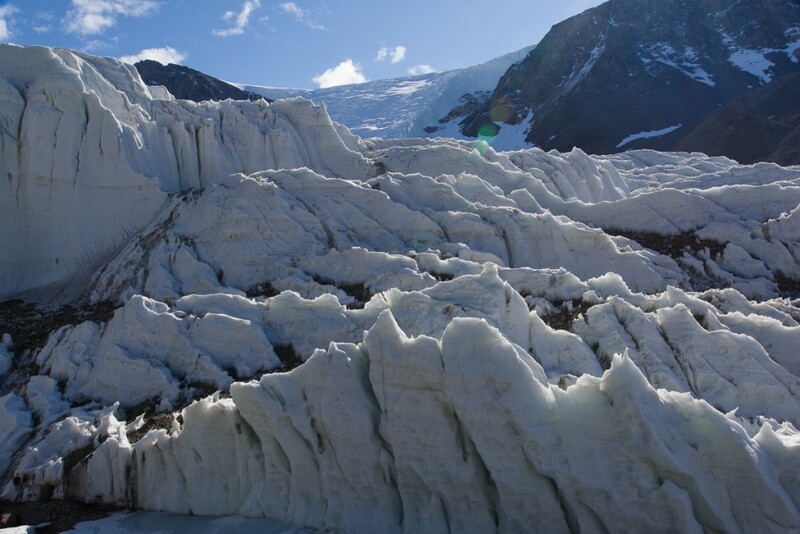 The tiny inverted white triangle at the end is the Suess Glacier. 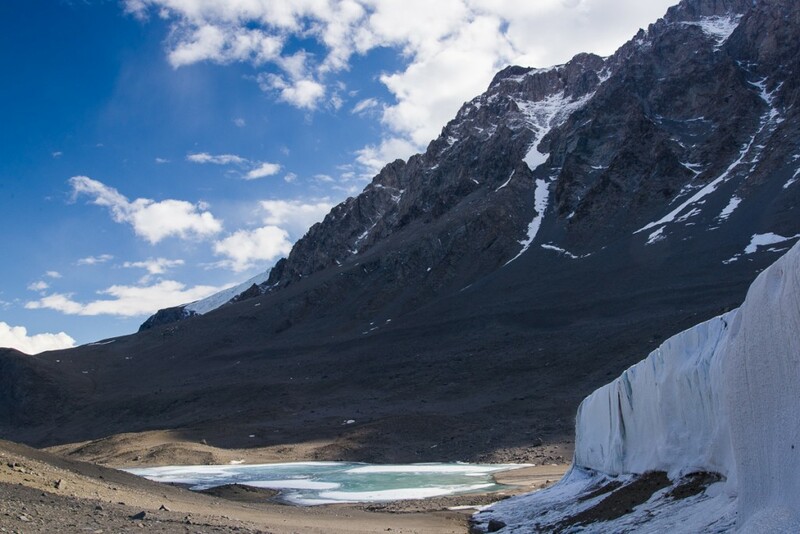 One day I hiked there accompanied by Mari, a young woman who normally worked at McMurdo in the field camp supply center, but was spending a couple of weeks at the Lake Hoare camp assisting camp manager Rae during a particularly busy period of the research season. There are many people in their twenties who work 10-hour shifts, six days a week at McMurdo during the austral summer as dining hall workers, supply staff, janitors, cargo loaders, etc., but their opportunities to travel beyond the base are limited. 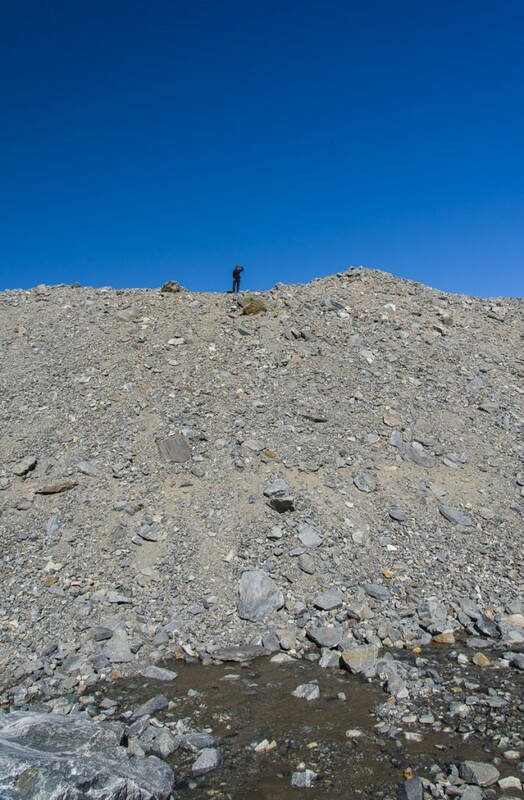 So Mari was thrilled to be in the Dry Valleys and enthusiastic about hiking to the Suess. We followed a path of sorts that had evolved from the walks of other researchers, which wound around the perimeter of the rocky north shore of the lake (on the right in the photo above). As we approached the Suess Glacier, we came upon a mummified seal. After about an hour, we came across a mummified seal. Positioned on its belly rather than laying on its side made it look curiously animated, as if it was in the process of clambering out of the water. 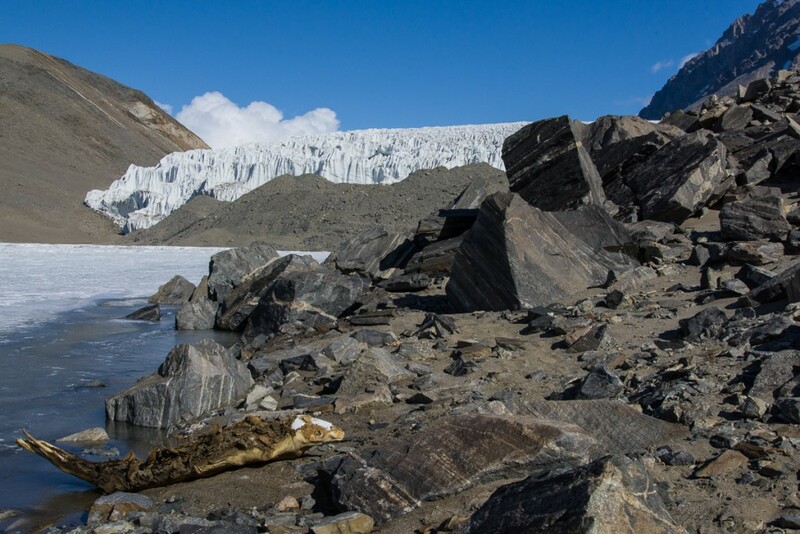 The mummified seals strewn throughout the Dry Valleys are an enduring mystery, and one I plan to write more about in a future blog post. Suffice to say, the icy climate and lack of organisms to break down dead animals keeps them in a state of preservation such that it’s difficult to know if that seal has been there a few years or a few hundred. Mari scouts the best path around a large hill of gravel. As we continued following the lake’s shoreline, we soon reached a very tall gravel hill that blocked our view of the glacier. Mari climbed to the top to scout the best route around it (remarkably quickly, too — it’s hard to get a footing on steep, loose gravel). As you can see in the photo at left, a stream of water was running downhill off the glacier into the lake. Mari had determined there was no shortcut to the glacier from where we were so we continued around the lake side of the hill. Panorama of the Suess Glacier from the end of Lake Hoare. 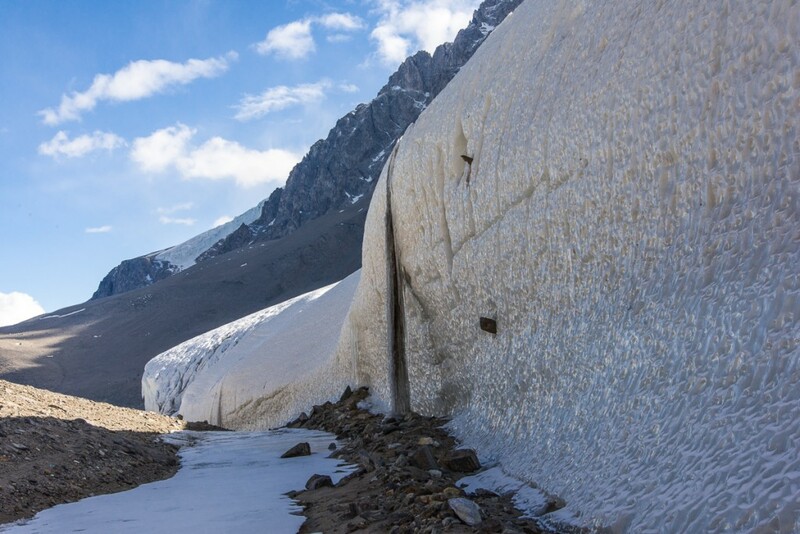 The glacier flows downhill from the right and comes to rest against the steep gravel hill on the left. The Suess Glacier, looking uphill to where it begins. 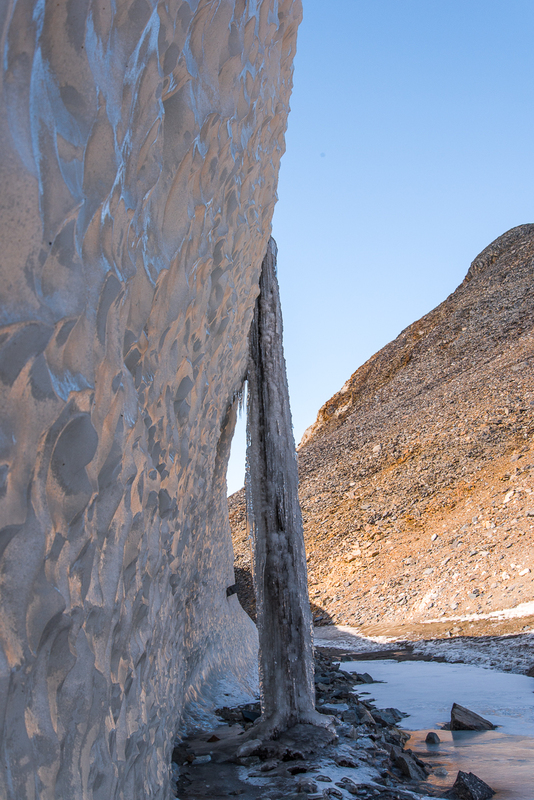 At the beginning of the defile, looking back toward Lake Hoare, the Suess turns into a wall of wind-scalloped ice and icicles. 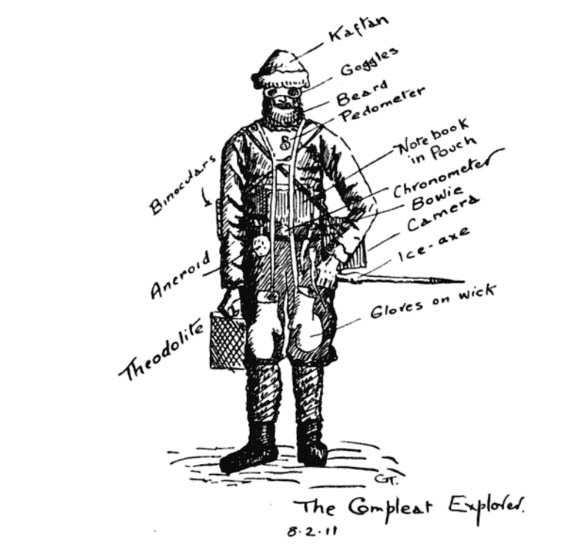 Griffith Taylor’s sketch of “The Compleat Explorer” was made on February 8, 1911, in the midst of exploring the valley that came to be named after him. Sketch of the Suess Glacier by Griffith Taylor, made in 1911 when he explored the area with Robert F. Scott. Taylor and company approached the Suess from the west, i.e. the opposite direction we took. His description remains apt today: “a face of ice forty feet high; but just where it butted into the steep south slope of the defile, there was a narrow gap where thaw-ice had filled in the interspaces between the cliff debris.” Mari and I put on crampons (velcro sandals with spikes on the soles) over our boots to walk on the icy passage where it narrowed to the width of a typical sidewalk. 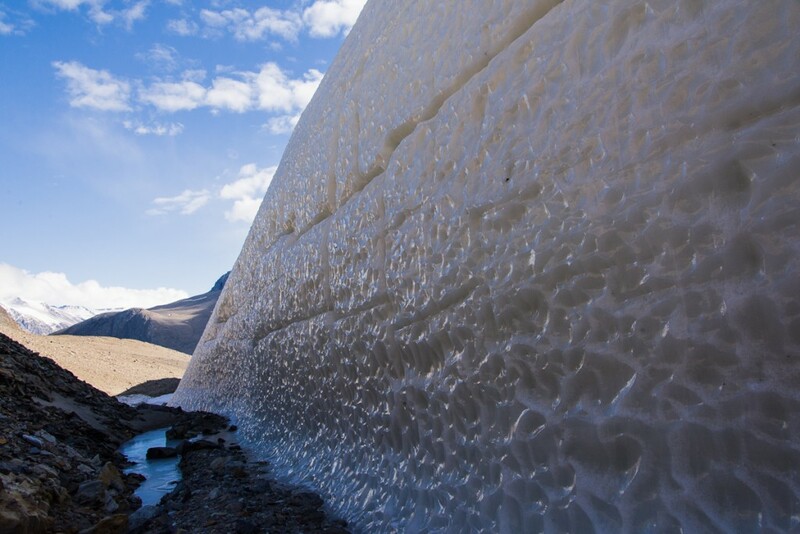 The side of the Suess Glacier bordering the defile is very different in appearance from any other glacier I saw: an icy, dimpled wall. Maybe it has to do with facing the defile, where it gets little sun and the wind is funneled through the narrow gap. 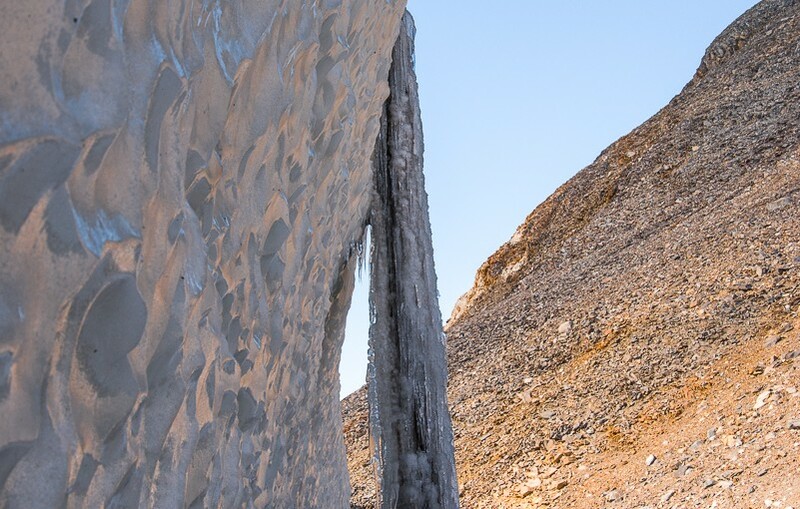 Freezing the action: a frozen waterfall of ice and sediment was an impressive sight. The other side of the frozen waterfall along the defile. That’s a big rock! And it looks like it’s not going anywhere anytime soon. 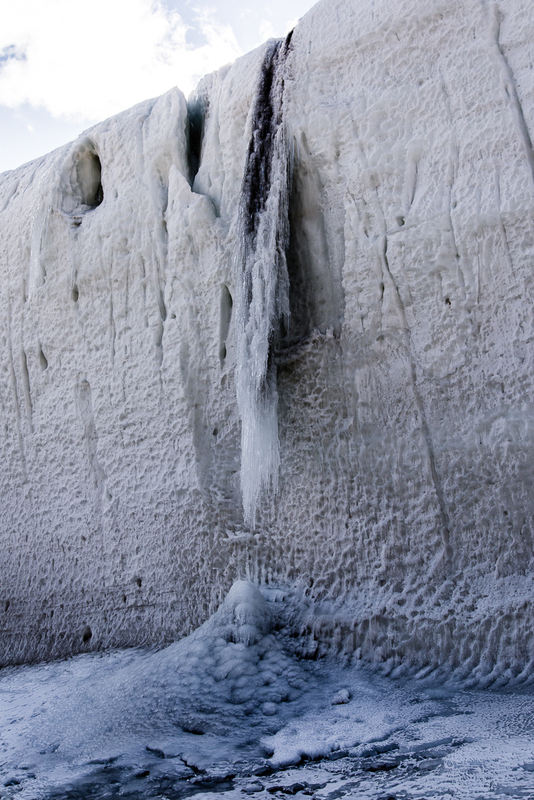 A smaller frozen waterfall gives an idea how the larger one probably looked before it connected into a column. The icy dimpled surface gives way to a frieze of smoother, rounded shapes. We reached the end of the defile, and looked down at the small blue lake on the other side (below). It was 5 p.m., we’d been out for four hours and decided to go back to the camp, figuring we’d be there in 90 minutes, just time for dinner. That was the time we decided to take a direct route back across the lake ice which turned out to be, ah, no shortcut at all for us lake ice rookies. If you haven’t read that story, you can find it here. Long story short, we made it back, albeit almost three hours later with wet socks. It was unnerving while we were in the middle of it, but funny once it was over: silver lining! 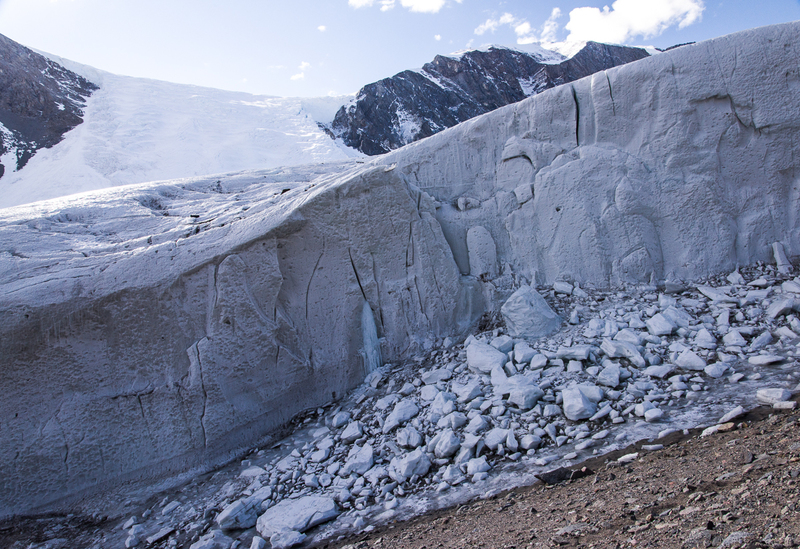 The west side of the Suess Glacier faces a small lake.